The game of lacrosse continues to grow worldwide, and on November 7th a team of 15 WPLL players will travel to growing lacrosse powerhouse Japan for a four day tour designed to bring high-level lacrosse directly to the people of Japan. Organized by Crosse-Crosse director Sachi Yamada, the WPLL Japan Tour will consist of clinics for youth, middle school, and university-aged players, a game against Team CrosseCrosse Japan, and a Draft Camp for players interested in being drafted to the WPLL. The 15 player team representing the WPLL includes several of the league's top players, including attackers Dana Dobbie, Kylie Ohlmiller, and Brooke Griffin, midfielder Amanda Johansen, defender Meg Douty, and goalie Kelsea Donnelly. At the youth level Japan continues to see increasing participation in lacrosse. An established international program, the Japanese Lacrosse Association was founded in 1987, making Japan the first Asian country with an international team. In 2017 the Japanese Women's National Team went undefeated during Pool Play at the FIL Rathbones World Cup. Japan finished the tournament in 9th place, earning an impressive final record of 7-1. A total of four Asian teams competed at the 2017 FIL Rathbones World Cup--Korea, Hong Kong, China, and Japan, and several other programs, including Taiwan and Thailand, also have an increasing lacrosse-playing population. Open to players from across Japan, the WPLL Draft Camp in Tokyo will give competitive players an opportunity to showcase their skills in front of WPLL representatives in hopes of joining the league. 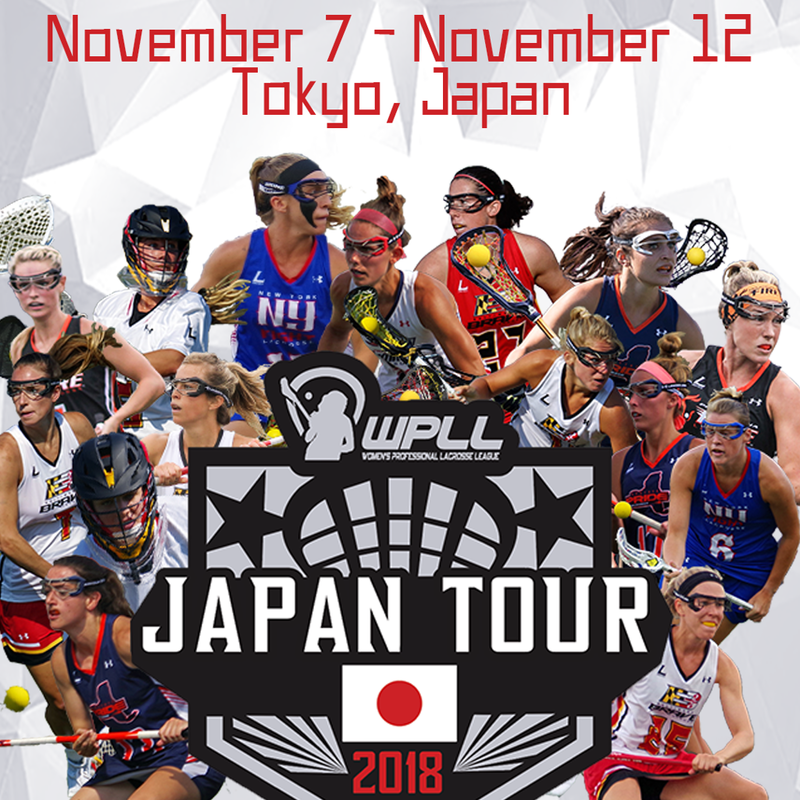 "There are a lot of talented players in Japan," explained WPLL Japan Tour Manager Liz Kittleman (Jackson), who has traveled to Japan to coach several times previously. "It is always impressive to see the level of play that the Japanese athletes exhibit in the international, college, and post-college game. The World Crosse Event gives youth players an opportunity to see where the game can take them, and it gives post-collegiate players a chance to compete professionally with the WPLL." While in Japan, Kittleman, along with WPLL representative, Rachael DeCecco, and Player/Coaches' Dana Dobbie and Megan Douty, will be responsible for evaluating players at the Draft Camp. This past season Hong Kong Representative Team attacker Hui Ka Hei was drafted to the Baltimore Brave, traveling to the United States to play professionally. Players attending the WPLL Draft Camp hope to do the same. "The hope is to grow lacrosse in Japan, but we need a trigger to spread the sport," explained Crosse-Crosse director Yamada. "By organizing WORLD CROSSE and inviting WPLL players from the United States, we believe that we can make an impact on Japanese players. We feel it is the right time to introduce what the best of lacrosse has to offer, exposing Japanese players to the top level of play. My dream is one day to have children dreaming of becoming professional lacrosse players." Crosse-Crosse is dedicated to growing the game of lacrosse in Japan. By exposing players to camps, clinics, and training sessions, the goal is to help Crosse-Crosse athletes become the best players they can be. Crosse-Crosse hopes to show players just how competitive the game of lacrosse can be. Through working directly with youth players and showcasing their skills in a full game the WPLL hopes to show the players of Japan exactly where the sport can take them. Though some youth players may just be starting their lacrosse journeys this very moment, hard work, practice, and determination can take their game to the next level. Together Crosse-Crosse and the WPLL hope to show Japanese players that they too can play the game at the highest level. Find a full list of players that will represent the WPLL below, and follow @prowomenslax on social media to stay up to date on the latest happenings in Japan.